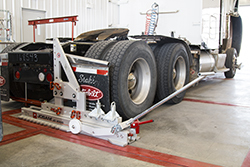 Our Body Shop is equipped with Josam in floor frame straightening equipment that leads the way when it comes to heavy duty frame straightening. Don't have a Peterbilt? That's ok. We will repair almost any frame damage on all makes and models of medium and heavy duty trucks. We are dedicated to servicing the oilfield, construction, agriculture, and transport industries in not only Edmonton, but all of Central and Northern Alberta. It doesn't matter if you need a horizontal or vertical repair, we can handle even the toughest of frame repairs. Why should you choose Stahl Peterbilt? Our mission is to provide the best customer service in all areas of our business. That means that you c an expect friendly service and accurate repairs from us every time. 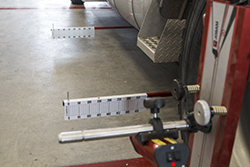 Our technicians are trained experts on Josam equipment, the latest and greatest in frame alignment systems. By using lightweight aluminum alloy presses and tools, we can complete the job faster and easier, which saves you money and shortens your downtime. We can save your vehicle. If you are in question of whether to repair or replace your bent and twisted frame, let us help you decide. Schedule an appointment with us, call 800.252.7981. Description: Your heavy duty truck will be back to brand new with our frame repair.